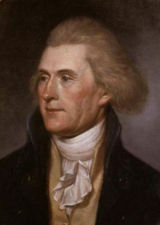 Perhaps the greatest communicator in the history of our nation was Thomas Jefferson. Interestingly enough, those who knew him said that he was a man of few words. In fact, Jefferson himself said that the biggest mistake a person could make was to say two words, when they could have been said what was needed with just one - Jefferson did not waste words. So, when this great communicator, Thomas Jefferson spoke, people knew that it was well thought out - and worth hearing. And then Thomas Jefferson gave these eight steps to a good and meaningful and rich life. I will save his most important step for last. Number 2 – Reverence and cherish your parents. Number 3 – Love your neighbors as yourself. Number 4 – Love your country more than yourself. Number 5 – Be just. Number 6 – Be true. Now each of these was sound advice for that young boy, and certainly great advice for us today. But, what was his number 1 advice? What did Thomas Jefferson consider to be the single most important thing to be done to best assure a good and meaningful and rich life? Number 1 – Adore God. Not just obey Him, serve Him, and love Him – "Adore Him." What must our part in our nation, America, today? What must we do to help make and keep our great nation, America, great? Work hard – sure. Be responsible for ourselves and our family – absolutely. But first, above all other things, put God back in His rightful place as the true Father of our nation – and adore Him.